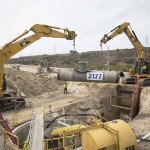 June 29, 2015 -After more than two years of work, Carlsbad Desalination Project crews installed the final segment of the 10-mile conveyance pipeline that connects the Carlsbad Desalination Plant to the San Diego County Water Authority’s regional water distribution system. Construction crews lowered the final piece of pipe – No. 2177 – into Macario Canyon in Carlsbad this morning, completing a major element of the historic project. The $1 billion Carlsbad Desalination Project is the result of a 30-year Water Purchase Agreement between the San Diego County Water Authority and Poseidon Water for the purchase of between 48,000 and 56,000 acre-feet per year of desalinated seawater. It includes three main components: the desalination plant, the pipeline, and about $80 million in upgrades to Water Authority facilities for distributing the desalinated water throughout the region. Overall, the project is more than 90 percent complete. The reverse-osmosis plant is on budget and on schedule to start commercial water production this fall, following approvals from state regulators. It will produce enough water to serve about 112,000 families and meet 7 to 10 percent of the region’s water demand. Construction of the 54-inch diameter pipeline began in spring 2013 in San Marcos. Crews worked in Carlsbad, Vista and San Marcos to reduce impacts on local businesses and residents. In coming weeks, crews will finish street restorations between Lionshead Avenue in Vista and the desalination plant in Carlsbad while they move closer to plant completion. The Carlsbad Desalination Project will include the largest, most technologically advanced and energy-efficient seawater desalination plant in the nation. It will produce an average of 50 million gallons of high-quality water per day and account for about one-third of all the water generated in San Diego County, helping reduce reliance on imported water at a time when hot and dry conditions are depleting water supplies statewide. During the three-year construction process, the project is supporting an estimated 2,500 jobs and infusing $350 million into the local economy. For more information about the Carlsbad Desalination Project, visit the project website at www.carlsbaddesal.com, or the Water Authority’s website, www.sdcwa.org.